My son, Toby, is 12 years old and happens to have Down syndrome. Three years ago, I decided to get him involved in sports activities with his typical peers. I chose flag football at the local YMCA since their philosophy is “...to provide a wholesome, values-oriented atmosphere where all children are given the opportunity to play! The purpose of YMCA Youth Sports is not only to teach sports skills effectively and in a fun way, but also to teach life skills – helping children today to become more effective adults tomorrow. We emphasize character development as much as physical development.” This seemed like a perfect fit! During the past 3 years, Toby may not have become the best football player, but he has had so much fun, learned some sports skills, but most importantly, he has learned what it feels like to be a part of a team! Toby spent the first years of his life neglected and abused in an orphanage in Ukraine, so feeling a part of something is foreign to him. He loves to be like his peers and feel included in what they are doing. Toby currently attends a school where he is fully included and most of his teammates are his peers from school, so they “get him”. It has been a great experience for him. Every season, Toby has been given more playing time and felt more a part of the team, until this past season. I understand that as he gets older, the competitiveness increases, but again, that is why I chose to keep him playing at the YMCA, where “all children are given an opportunity to play”. Unfortunately, each game, Toby got less playing time. What concerned me the most was the lesson that his teammates were learning. Was Toby really a valuable member of their team or was he just there for his token “Toby Play” at the end of the game? (The “Toby Play” was the last play of most games where Toby was given the ball and escorted into the endzone by his teammates. 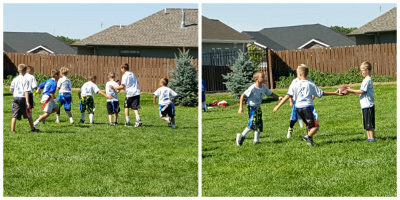 His “touchdown” was followed by his touchdown dance with him and all his teammates.) Don’t get me wrong, I appreciated their efforts to allow him to feel he contributed to the team, but felt he deserved, and was capable of, participating in more than one play per game. As the season progressed, his time on the field decreased more and more. This led to him being bored on the sidelines, which caused more behavior problems. I never said anything because I didn’t want to be “THAT MOM”, but each game I watched him sit out, it hurt my heart more and more. The last straw was the first tournament game. Toby was so excited! As always, on the way to the game, we went over appropriate behavior and how important it was to listen to his coaches. As soon as we got to the field, he ran excitedly over to his teammates on the sidelines, eagerly awaiting the game to begin. However, his chance to play never came, despite the fact that whenever the coach looked to the sidelines to put new players in, one specific teammate kept pointing to Toby...he sat the whole game out. I left the game feeling defeated, despite the score. I tried to hold in my tears, but when we got in the car and Toby started signing, “Sorry” over and over, I couldn’t hold them in any longer. My son believed that he hadn’t been able to play because he had done something wrong! I couldn’t remain silent any longer! That night, I wrote and rewrote sample emails in my mind. Then, I finally sent one to the coach expressing my feelings about the season and this game in particular. I understand that it takes more work, time and patience to include my son. I realize that it is probably easier to leave him on the sidelines, but doing what is right isn’t always easy, in fact, it rarely is. All Toby wants is to be like his peers and to feel included. The more he is allowed to participate in similar activities, the easier it becomes to fully include him. So, I sent the email and waited several LONG days to receive a response. In fact, I ended up getting replies from both coaches. They both agreed that they had gotten caught up in the game and when they realized that they didn’t get Toby in, they were “devastated” and felt they had failed him. Guest Blogger Suzanne McDonald is a parent and member of the Kearney Inclusive Education Lay Advocacy workgroup. Interested in Inclusive Education? You can find more information on our Inclusive Education Lay Advocacy Program webpage.